This is a billion of dollars business today. Investors are well aware that the industry will set to grow manifolds in the coming time. A report claims that $11 billion is generated with football on which around $1.5 billion revenue is generated through fantasy football. Likewise, cricket fantasy sports are also turning into billions of dollars of business. So, in this digital age, the future of fantasy sports is bright. Investors who are interested in investing the virtual gaming world are contacting the best fantasy sports software developer. In the initial phase, they are looking to create a website or a mobile daily fantasy sports software. Let’s discover the ways fantasy game investors are increasing their revenue. Big investors of the industry have strategically designed the gaming rules. Many of them are taking fees for participation that is how they are earning most of their revenues. The amount generating through this medium is using for cash-prize contests. They are taking 10% or more cut and the rest is spending for funding the prizes. The big players in the industry have left no stone unturned to encourage users to involve in the game. They are offering weekly lucrative gaming contests. The winning prize can be increased as much as you want by betting more. Fantasy sports are getting popular day by day. Fantasy sports solutions like mobile apps and websites are designing in the way to display ads. Popular fantasy websites and mobile apps are giving other businesses the platform to display their ads. This is how fantasy sports businesses are earning revenue. 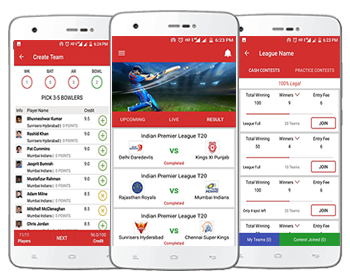 During development of a fantasy sports league software, investors have options to develop Android powered program or iPhone. A large number of people are now using Android based smartphones but it doesn’t mean that the Apple device popularity is not growing. Big investors in the fantasy industry have launched not only Android but also Apple based fantasy games. The prime aim is to attract more users which will definitely give a boost to the revenue. Investors of the virtual game know how to attract more users to their portals. The first participant is tempted to register and play the game at free of cost. The feature helps to understand the game to those who are willing to become an active member of the gaming site. The idea of a free league definitely attracts more users. It increases the chance to get more new members which alternatively give benefits to investors. Those who are members get extra services by offering free leagues. The strategy encourages participants to indulge in the gaming more. So, the more they play, the more the investors get profits. These are some super cool ideas adopting by fantasy game investors. The virtual game is a game of skills. So, it is legal in India and many countries. Both large and small organizations can invest in the virtual game. This is an emerging business which future is bright.